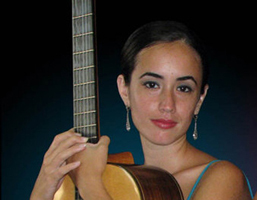 Susana Frade Machado is a Cuban professional guitar player that joined Duo Con-trastes in 2009. In 2014, she made a concert tour with Duo Con-Trastes in the South of France as part of the promotion of their first album “Contrastes”. She also performed as a soloist at the Paris’s Cathedral that same year. Frade has performed at important national festivals like Identities Festival, Festival of Poetry, Young Guitar Festival of Camagüey and Children´s Festival Isaac Nicola. She has also performed in the most prestigious concert halls along the country, like “Iglesia de Paula”, “Basílica Menor del Convento de San Francisco de Asís” and “Casa de Las Américas”. In 2007 and 2008 consecutively, she won the First Prize in the Musicalia categories of standard and higher level at the National Guitar Competition Isaac Nicola. In 2010 she participated again, this time winning the second prize. In 2014, at the International Guitar Festival of Havana, she obtained a special Mención from the jury, for the performance of José Ardévol’s Sonata and Marlos Nobre’s Seresta. Born in Havana on May 11th, 1988, in Havana, Frade holds a Bachelor’s Degree in Music with a major in guitar performance. She is a member of National Center for Concert Music, the Cuban Union of Writers and Artist (UNEAC), and the SaízBrother´s Associations (AHS).